Here in Japan, there are lots of bright beginnings to celebrate. -- The Pension Problem in Japan. -- Too Dangerous to Document? Frozen Fish That Tastes Fresh -- Really! Scary but true, Hokkaido's iced sushi is coming to you. Mobile medical care from an entrepreneur fast on the make. Japan's "second city" seeks to save its plummeting prices. Money master Darryl Whitten weighs in. An inside look at Hayao Miyazaki's magic kingdom. The where, when, how and why of Japan-to-China FDI. An unsung Osaka landmark turns slaking thirst into an education. A generous glimpse at a Japan you only thought you knew. Like shooting stars across a winter sky, satellite digital television signals are streaking to earth for the first time ever in Japan. Starting this month, super-sharp TV hits the ground running. Tune in. Blue Christmas? 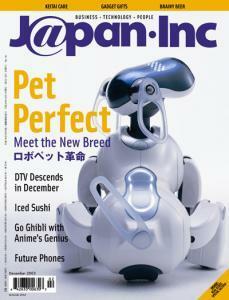 The latest breed of Robot pets bows and wows consumers with greater sensitivity and savvy. Buy into the "comfort toy" phenomenon, and you'll never be lonely again. Jeff Funk phones in with news from his latest book, Mobile Disruption: Key Technologies and Applications that are Driving the Mobile Internet, published this month. According to the author, we ain't seen (or heard) nothing yet. Japan has always been heavily populated and short of land. Only about 28 percent of Japan's land mass is inhabitable, so it's no surprise that one of Japan's most precious commodities today is real estate. On networking, booze and battling the blahs.